Design ideas for a children's play area. 1 Positioning a safe play area. In a large garden size isn't critical but location is, plan to install the play area where you can easily keep an eye on the children playing, without being over intrusive. In a small garden you might want to think about your own space for washing lines, dining areas and even space for the bins, too late once you have spent money installing the safe play surface for the kids. 2 Combining gardening and play. 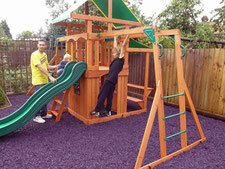 3 What are the best materials to surface a childrens play area. ....bark and rubber chippings but in recent years with council led health and safety gone mad the cost of installing "safe" surface materials for children's play areas has become expensive and out of reach for most of people. Our councils, as usual, have led the rush to spend our money on totally over the top and unnecessary play area surface installations. The commercially available playing surfaces you see in parks, schools and other public play areas, favoured by our councils are too expensive for most off us to install in our gardens. They need specialist installation as most come in liquid form and are poured onto a prepared surface, in the same way as concrete, The price of installing this kind of safe children's play area can be prohibitive . information about the best surfaces for safe play areas. Loose Materials correctly installed to the manufactures instructions are as safe and much cheaper than the "pour in" type of impact absorbing surface. Sand, bark, wood or rubber chips all work well but will need raking out and topping up now and again. Pros and cons discussed here. This research paper prepared for the UK Health and Safety Executive by Professor David Ball (http://www.hse.gov.uk/research/) is worth reading. Quote taken from the report "Amongst other things it found that the effectiveness of Impact Absorbing Surfaces in injury prevention is limited and there is little scientific evidence to support the claims made for it, especially in long-bone fractures resulting from body weight descending on the limb or an awkward fall. It may reduce the severity of certain types of fall, for example, onto a joint. It may reduce the severity of the relatively rare head injuries". Although trips and falls are an everyday part of the growth and development of our kids ,and we don't want to cover our kids in cotton wool before sending them out to play in the garden, this should not mean we would not want to make our gardens children friendly. According to The Royal Society for the Prevention of accidents, the most common accidents are caused from falling from slides, climbing frames, swings etc. So if you are thinking of adding play structures that mean a child is playing at a fall height of 1500mm or over you will need to pay more attention to the surface of the play area under and around these play structures. More about suitable playground surfaces here below. Sand has all the compaction properties but is a problem if the kids are in and out of the house, especially if it rains, so is probably best confined to the sandpit. Rubber chips made from old car tyres, doesn't degrade, drains really well, comes in a choice of colours and wont compact as easily as bark and costs about the same. How can children play safely outside without getting muddy! These rubber mats with a Rapra critical fall height of 3m rating, mean you can lay the mats around Playground Equipment knowing you are complying with BSEN 1177. Rapra Tested with a critical fall height of 3m! Grass grows through the rubber mats and can be mowed! Grass with at least 150mm of sub soil is a very suitable surface for falls up to a height of 1500mm. Grass is popular choice for children's play areas in the garden because it is a natural material and has some strong developmental value for children, especially if mixed with wild flower seeds. Allowing the grass to grow longer helps to retain moisture in the soil, keeping the surface softer and safer. During dry spells the turf can break up so its a good ideal to keep it watered. In freezing weather the turf can become quite hard, meaning the Kids may have to give it a miss until it thaws out. Although a study did find little difference between grass, rubber and bark in freezing conditions. More information on my other pages about surfaces materials for kids safe play areas? Combining gardening and play, create a child's garden.